I went to an aerial hoop class this evening. I have been taking these classes for about two months. I really like my teacher, Helga. She is like "now it will hurt here. And now it will hurt there" pointing out different body parts. It's fun and challenging but sometimes scary. I was tired today and didn't have much energy and I fell. I didn't hurt myself but it freaked me out a bit. In the class it is better to have more skin covered than not because the hoop has quite a rough surface. So I spent some time doing some sewing this afternoon. I had to make leggings to wear, and I also half finished a new pink sporty top. The leggings are soooo comfortable. Made from deliciously soft navy cotton jersey. They are a wee bit see through. Ok. A lot see through. But for these, comfort wins over decency. The best thing about going to Buda is walking back home to Pest afterwards. I love my long walk home, it is one of my favourite parts of the day. 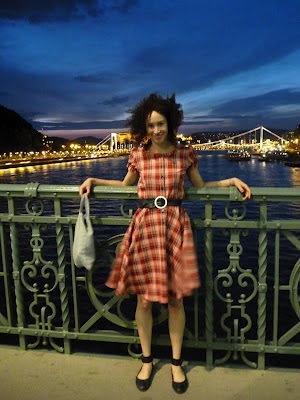 The city is gorgeous, especially by the Danube at night. and i love that shot of you on the bridge, i can almost feel the delicious walk home in your me-made loveliness. Wow! That class looks really challenging but SO COOL! And that walk home sounds enchanting. I really like your dress, especially the sleeves and neckline. That aerial hoop class looks amazing and difficult. I love your plaid dress. One of the reasons I'm not participating in MMM is because I have no me made workout clothes and I don't want to make any since I already have perfectly good bought ones. I was sorry to see you didn't join us! You should have made a workout clothes exception!